This is Brothers All Natural 3rd Annual Fruit Bowl! Receive a FREE football Fruit Bowl square when you purchase ANY SIZE Pear OR Apple Cinnamon Fruit Crisps. 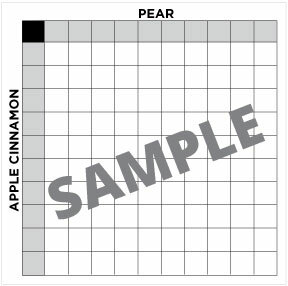 Fruit Bowl Squares subject to availability, 100 squares per board total, squares will be filled on a first come, first serve basis. Fruit Bowl Square scores will be held in conjunction with the 2019 Brothers All Natural Fruit Bowl, Fruit Bowl highlights and score updates will be aired live on our social media on Sunday February 3rd, 2019 @ 10:30 AM (EST). Winners will be announced Monday February 4, 2019. Winners will be listed on the Fruit Bowl Squares page shown above. Each winner will be notified via email. No payment or purchase is necessary to receive prize. Prizes will be shipped to winners based on the shipping address of the qualifying order. Sweepstakes participants and winners eligible to US residents ONLY. Sweepstake entries valid between 1/15/19 through 2/01/19 ONLY. Submissions received after 2/01/19 will not qualify for entry. Winner to be announced 2/04/19. 1. 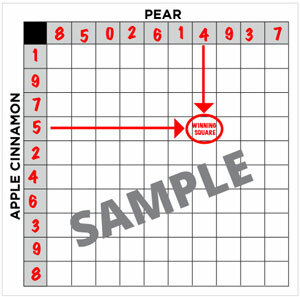 The Apple Cinnamon team will be assigned to the rows, and the Pears team will be assigned to the columns. 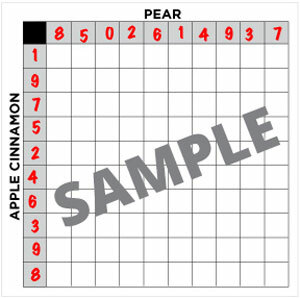 Once a qualifying purchase is made (ANY SIZE Pear or Apple Cinnamon Fruit Crisps) the participant will be randomly placed on a Fruit Bowl Square. Each square for participants will be chosen randomly, 1 participant per square. Multiple qualifying purchases will qualify the participant to WIN more than 1 Fruit Bowl square, based on availability. 3. The grid is now complete, you just need to wait until the Fruit Bowl is played to determine who will be the winners. A winner will be determined at the end of the 1st quarter, 2nd quarter, 3rd quarter, and Final Game score. The winner is determined by looking at the last number in each teams' score, and then matching those numbers on the grid and seeing which square intersects those two numbers. Promotional giveaway hosted by Brothers All Natural.com. Giveaway eligible to US Residents ONLY, 18 years of age or older. 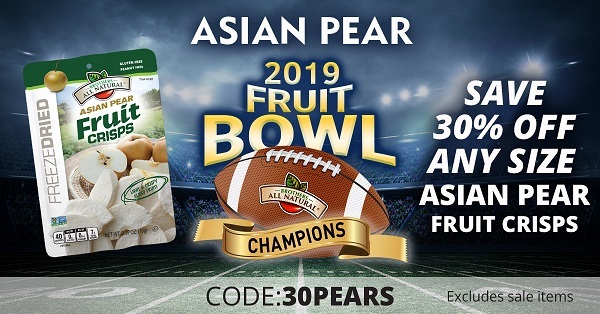 Any Apple-Cinnamon or Asian Pear Fruit Crisps purchase between 1/16/19 – 2/1/19 will automatically receive a FREE football Fruit Bowl square, subject to availability. The free fruit bowl square will be added to your eligible order. 100 squares per board total, squares will be filled on a first come, first serve basis. Please allow up to 48 hours for your square to be posted. Fruit Bowl updates will be aired live on our social media on Sunday February 3rd, 2019 @ 10:30 AM (EST). 4 total winners per board 1st quarter score match (subject to 1 winner) will WIN a FREE 24 pack of WINNER’S CHOICE of either Pear or Apple Cinnamon Fruit Crisps ($23.99 value) (odds of winning: 1:100) 2nd quarter score match (subject to 1 winner) will WIN a FREE 48 pack of WINNER’S CHOICE of either Pear or Apple Cinnamon Fruit Crisps ($47.98 value) (odds of winning: 1:100) 3rd quarter score match (subject to 1 winner) will WIN a FREE 24 pack of WINNER’S CHOICE of either Pear or Apple Cinnamon Fruit Crisps ($23.99 value) (odds of winning: 1:100) 4th quarter score match GRAND PRIZE (subject to 1 winner) will WIN a FREE 96 pack of WINNER’S CHOICE of either Pear or Apple Cinnamon Fruit Crisps ($86.99 value) (odds of winning: 1:100) Winners will be announced Monday February 4, 2019. Winners will be listed on the Fruit Bowl Squares page shown above and linked HERE. Each winner will be notified via email. No payment or purchase is necessary to receive prize. Prizes will be shipped to winners based on the shipping address of the qualifying order (we cannot ship to PO Boxes). No purchase necessary, alternate entries can be submitted and will be accepted between 1/16/18 - 1/28/19 until 11:59pm EST. Please mail your request for a Fruit Bowl square to the following address: Fruit Bowl Square, Brothers All Natural, 1175 Lexington Avenue, Rochester, NY 14606 . Mail in entry requests must include your complete name, shipping address, email address and telephone number. Fruit Bowl mail in entries must be received by 1/28/19, any mail in entries received after 1/28/19 will not qualify for submission. A purchase will not affect your chances of winning, fruit bowl square numbers will be randomly drawn. Prizes cannot be transferred or exchanged. Void where prohibited by law.